Between 1914 and 1917 – prior to the United States’ entry into World War I – more than 3,000 American volunteers, paying their own passage, set sail for France to aid the war effort. Model T’s to War focuses on the valiant work of the American Field Service, ambulance sections assigned to help the French Army in its fight against German forces. 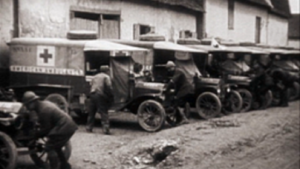 These young men drove Ford-built Model T’s to the front lines and saw their greatest glory in the battle of Verdun in 1916, when Field Service ambulances transported more than 250,000 wounded. Although American readers regularly followed the adventures of these brave ambulanciers through numerous accounts published in local and national newspapers of the era, few today know about their heroic deeds. Model T’s to War seeks to shed light on this forgotten story. On CPTV: Tuesday, April 11 at 11 p.m.